250121 M20 MaK M20 diesel engine General Operating Instructions (Operating, Maintenance, Tools). Additional Service Information. 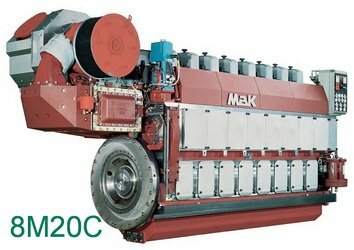 250122 M20 MaK M20 diesel engine Genaral Spare Parts Catalog and Stand-by Parts List. 250123 M20 MaK M20 diesel engine Air Starter System PS 32/20 Drawings and Spare Parts List. 250124 M20 MaK M20 diesel engine Operating instruction Manual, Maintenance, Tools. Spare parts and Stand-by Parts List (catalogue). Air Starter System - Drawings & Spare Parts List. Additional Service Information. 250125 M20 MaK M20 diesel engine Operating instruction manual, Maintenance, Parts catalogue, Turbocharger R 4-3, Tools. GERMAN LANGUAGE. Additional Service Information. 250226 M25 MaK M25 diesel engine General Operating Instructions (Operating, Maintenance, Tools). Additional Service Information. 250227 M25 MaK M25 diesel engine Genaral Spare Parts Catalog and Stand-by Parts List. 250228 6M25 MaK 6M25 6 cylinder diesel engine Operating Instructions, Maintenance, Tools, Spare parts Catalog. Additional Service Information. 250229 8M25 MaK 8M25 8 cylinder diesel engine Operating Instructions, Maintenance, Tools, Spare parts Catalog. Additional Service Information. 250333 M32 MaK M32 diesel engine Operating Instruction Manual, Maintenance, Tools. Additional Service Information. 250334 M32 MaK M32 diesel engine Spare parts Catalogue and Stand-by Parts List. Additional Service Information. 250335 M32 MAK M32 L and VEE engines - Engineer's Handbook (Data, Design, clearances, tightening torques, adjusting etc. All what you need for maintenance and repair). Additional Service Information. 250336 M32C MAK M32 C - Operating, Maintenance and Parts Instructions. Document includes: Woodward Governor UG40-Di and booster servomotor, PLEIGER ELECTRONICS Three-position Controller, Electrical Equipment, Circuit diagrams Engine 8M32C, Description of the Engine Monitoring Devices, Pressure reducing station R417000844, R417000845, R417000888, Description of the RPM Switch Unit, Description of the Safety System, NAPIER 357 Turbochargers (with parts list), Propellerplant Lipstronic 7000 B, electrical diagrams, Exhaausf gas measurhg unit AMW 2 etc.). 2632 pages. Additional Service Information. 250338 VM32 MAK VM32 diesel engine - Operating Instruction. 250339 VM32 MAK VM32 diesel engine - Maintenance manual. 250340 VM32 MAK VM32 diesel engine - Spare parts Catalogue. 250341 R/VM32 MAK VM32 diesel engine - Operating and Maintenance Instruction. 250380 GCM34 MAK GCM34 Gas diesel engine - Operating Instruction. 250381 GCM34 MAK GCM34 Gas diesel engine - Maintenance manual. 250441 M43 MaK M43 - Operation, Maintenance, Spare Parts, Accessories with spare parts. Document includes: Woodward Governor UG40-Di and booster servomotor, PLEIGER ELECTRONICS Three-position Controller, Electrical Equipment, Circuit diagrams Engine 7M43, Description of the Engine Monitoring Devices, Description of the RPM Switch Unit, Description of the Safety System, Turbochargers TPL 69A? - 85A? (with parts list), Oil mist detector Visatron, DOCUMENTATION DOKU1G452W0026E VULKAN RATO-S Coupling, electrical diagrams, Electrical equipment of engine monitoring etc.). 1826 pages. Additional Service Information. 250442 M43 MaK M43 - GENERAL Operation Instruction, Maintenance (workshop) Manual, Spare Parts Catalog. 3675 pages. Additional Service Information. 250446 VM43 MaK M43 - Operation Instruction, Maintenance (workshop) Manual, Spare Parts Catalog. 1279 pages. Additional Service Information. 250510 M281-M332 MAK M281, M331, M332, M332C In-line and M282 Vee Diesel Engines Engineers Handbook. Operating and Maintenance Instruction, Tools (data, Design, clearances, tightening torques, adjusting etc. All what you need for maintenance and repair). Additional Service Information. 250520 M451, M452, M453 MaK diesel engines 451 / 452 / 453 - Engineer's Handbook. Operating manual, Maintenance, Tools (data, Design, clearances, tightening torques, adjusting etc. All what you need for maintenance and repair). Additional Service Information. 250530 M453C MAK M453C diesel engine Operation and Maintenance Manuals, Spare parts catalogue. Additional Service Information. 250540 M551, M552 MAK M551, M552 diesel engine Engineers Handbook. Operating and Maintenance Instruction, Tools (data, Design, clearances, tightening torques, adjusting etc. All what you need for maintenance and repair). Additional Service Information. 250550 M601, M601C MAK M601, M601C diesel engine Engineers Handbook. Operating and Maintenance Instruction, Tools (data, Design, clearances, tightening torques, adjusting etc. All what you need for maintenance and repair).